This unique, one-piece molded body has no seams, welds or crevices to trap particles and is easy to clean. The cover is hand-removable and features an all-plastic, built-in vent valve with integral 1/4″ gauge tap. The two bottom pipe connections are interchangeable as outlet or drain, permitting easy, no modification in-line or loop piping arrangements to accommodate any installation design. 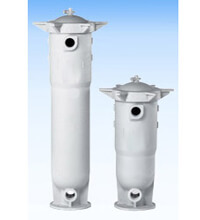 For contamination sensitive or severely corrosive filtration applications, the PPL and PVDF Vessel line is your best choice. A quick quarter-turn of the operating lever diverts the flow from one filter vessel to the other through the unique CPVC plastic valve assembly. The flow is never stopped, your process continues to run during bag changeouts. Automate your Polyline duplex filter for hands-off remote operation. Operation of the valve assembly can be controlled by either pneumatic or electric actuators from a remote location or by computer control at a cost-effective price. Installation is simplified by the integral plastic mounting skid–standard with all Poly Flow Vessels. A quick quarter-turn of the operating lever diverts the flow from one filter vessel to the other through the unique CPVC plastic valve assembly. The flow is never stopped, your process continues to run during bag changeouts. Automate your Polyline duplex filter for hands-off remote operation. Operation of the valve assembly can be controlled by either pneumatic or electric actuators from a remote location or by computer control at a cost-effective price.Installation is simplified by the integral plastic mounting skid–standard with all Poly Flow Vessels.